Peckham was a hamlet of the parish of Camberwell, situated about a mile to Camberwell’s east on the road to New Cross. The name means ‘the place of the river Peck’, a small steam that runs through the district. Peckham has never been an administrative district, or a single ecclesiastical parish in its own right; nevertheless, today it has a strong sense of local identity. This has its roots in its 19th century development from fields to suburbs, and crucially the development of Rye Lane as one of the most important shopping streets in south London. 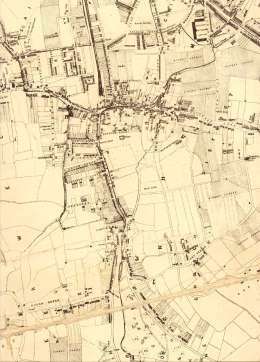 Until the early 19th century it was largely a rural area with a number of large houses occupied by the gentry. In the 18th century the Grand Surrey Canal was built and terminated at Peckham High Street, but the canal had little direct effect on development. Its development divides into two phases. The earlier phase, up to the 1860s, took place in two areas: to the north impressive villas and terraces in the area near the Old Kent Road, To the north development was stimulated by proximity to the Old Kent Road, and to the south large houses built in prime locations near Peckham Rye, the area’s common. A new district called Peckham New Town was built on land owned by the Hill family, centred on Peckham Hill Street; the family gave its name to the area’s main axis, Peckham Hill Road. The second phase of development was sparked by the coming of public transport: railways and, more important, horse trams in the 1870s. This stimulated much building of a more modest scale in almost any open space. Indeed the common land at the Rye was also threatened with development. Rye Lane evolved into a new shopping street encouraged by good transport and a new, young and relatively prosperous population. Stores such as Jones & Higgins became the best known in south London. This section of the Dewhirst map of the parish of St Giles, Camberwell, shows the first stage of transition of the area from a rural village to a London suburb. 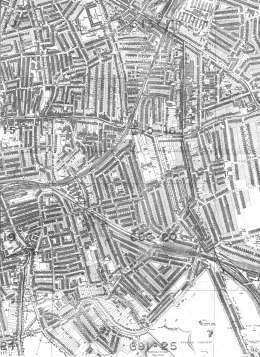 Ribbon development has taken place along the Old Kent Road (top right), Hill Street, the High Street and Rye Lane. Prime plots facing south west looking over Peckham Rye have also been developed. This 1891 map shows Peckham on the way to becoming a London suburb. Click on the map for a larger view or click here for a readable version which may be slow to download. Railways have been built (as have tram-lines, though they are not indicated here), and most sites near main roads have been developed. However, large tracts of remaining agricultural land are still to be developed.